Plan, and then plan some more. This cannot be overstated. Before a single phone call has been placed, or product selection made, you must consider and answer this most basic question. Why do I want to remodel? Do any of the following describe your situation? Are you a new homeowner who needs to address changing family needs? Do the colors and materials just not suit your tastes? Have you lived in the house for a while and just want to upgrade? Are you sprucing it up to sell? I know that it seems like a silly question, but the answer usually helps define the overall scope and budget of the project. Always keep the answer to that question in the back of your mind it will help keep you on track and avoid escalations. Next let's determine what is it that you and your family like and dislike about the spaces/rooms you want to remodel? Make a list. If you find things that you like within a specific space, keep them if you can. Removing something you like just for the sake of remodeling sometimes leads to regrets. Besides, sometimes it's nice to keep a piece of history if it is appropriate for the space. If you are working with a designer or architect let them know about the things you would prefer to keep. Maybe it’s a specific molding, window or door. They have many clever ways of keeping important features and incorporating them into the new design theme. Finally (well not really) but for this part of our journey the last task we need to do before moving on is to create a wish list and design collection. During this stage, we'll be putting your dream home together in your mind. Start by picking up an inexpensive scrapbook at your local craft store. This will give you a place to put all the data you collect. Cut out things you like in magazines. It doesn't have to be a complete design idea. Maybe it is just a color contrast or type of tile. Or just a picture that reflects your decorating style. Take pictures of things that you see as you drive around. Go to home shows if you can and pick up brochures. Get color swatches at your local paint shop or home center. You can also search for photos on specific themes on the internet. Put these all in your scrapbook. Don't have time to read the over 120 pages on this site? For our wish list, write down everything you would like to include in the renovation. Don’t worry about the budget right now, we can tweak that later just list everything you would like. Try to be thorough. Include furniture, appliances, fixtures, accessories and anything else you can come up with. Please do not underestimate these steps. We will use them as reference points as we go along. They will help define our success. 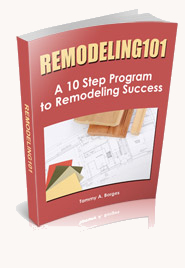 Remember the old adage "If you fail to plan then plan to fail" could not be truer when it comes to renovating. Once we have reviewed and completed all the tasks in our Master Plan, we can move on to our next phase. But first lets look at how to create the budget. A critical step in our process. As well as how a project schedule can help keep your budget on track.